I’m not a big fan of maple. Syrup, candy, ice cream… just, no. Mostly because it reminds me of Canada… but aside from that, just not a huge fan. I put it on waffles and pancakes, but even then I don’t use much. I do, however, love bacon. And I wanted to make some breakfast cupcakes because in my mind that justifies me eating baked goods in the morning. But to be fair, I can justify just about anything for breakfast. It’s almost like a game for me. I ran through some ideas related to eggs, waffles, pancakes (and I came up with a couple other ideas soon to come)… and I eventually landed back on bacon. After some experimentation I discovered that bacon with a little bit of maple was just right. Maple and bacon in the batter. 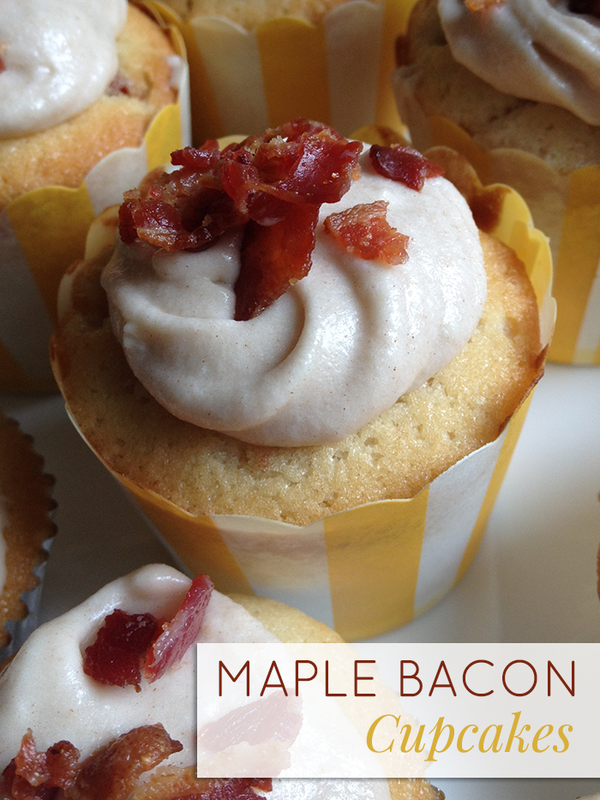 Maple in the frosting, bacon on the top. Salty, sweet. Bacony. You’re welcome. 1) Preheat oven to 400° F.
2) Cook bacon however you prefer to make it nice and crispy – I like to bake it in the oven on a baking sheet for about 8-10 minutes at 400° F. Let it cool on a paper towel-lined plate and then crumble. 3) Lower the oven temperature to 350°F and line muffin pan with cupcake liners. 4) In a small bowl, mix flour, baking powder and salt in a bowl. 5) In a large bowl bowl, cream butter and then add sugar until mixture is fluffy. 6) Add eggs and mix well. Add about 1/2 the dry mixture from the small bowl, add milk, and then add the rest of the dry mixture. 7) Add vanilla and maple syrup and mix until well combined. Stir in 3/4 of your prepared bacon to distribute throughout batter. 8) Fill each muffin cup 3/4-2/3 full and bake for about 25-30 minutes. Tops of cupcakes should be just slightly light brown. A toothpick entered into the center should come out clean. Set on cooking racks to completely cool. 9) While cupcakes are cooling, prepare frosting in large bowl by beating together butter and cream cheese. 10) Add maple syrup and cinnamon and mix well. Now add powdered sugar and whip until well-combined at a medium-high setting. 11) Place frosting in fridge for about 15 minutes to let it firm up – the maple syrup causes it to lose a little bit of it’s fluffiness. 12) Pipe frosting onto cooled cupcakes and add crumbled bacon on top of each. Leslie you’re amazing! These are ridiculous in the best way possible ?? ?